Fred went to the Utah State Bar and Judicial conduct commision. Since Fred's many visits to the Judicial conduct commision, their offices have mysteriously relocated to Ogden, Utah, some 30 miles away from the Capitol. How does this figure to serve the citizens, if the location is moved to some obscure place up north? People are thinking it was because of Fred,... bad, badass, Fred...THE PHOENIX. The Frank Moss Federal Courthouse in Utah is celebrating 100 years of service. US Senator Orrin Hatch being a proponent of the Rule of Law, the US Flag amendment, and member of the Senate Judiciary Commitee; will he stand up for any citizen like Fred, who is embroiled in fierce courtroom battles involving the unjustness, nonethical standards, and illegal practices in Utah and its courts? It was amazing listening to "Blowhard" Salt Lake City Mayor Rocky Anderson and how the majority of people there didn't understand the Gonzo symbol or know of Hunter S. Thompson, and that an INVERTED AMERICAN FLAG STANDS FOR DIRE DISTRESS and not for disrespect. 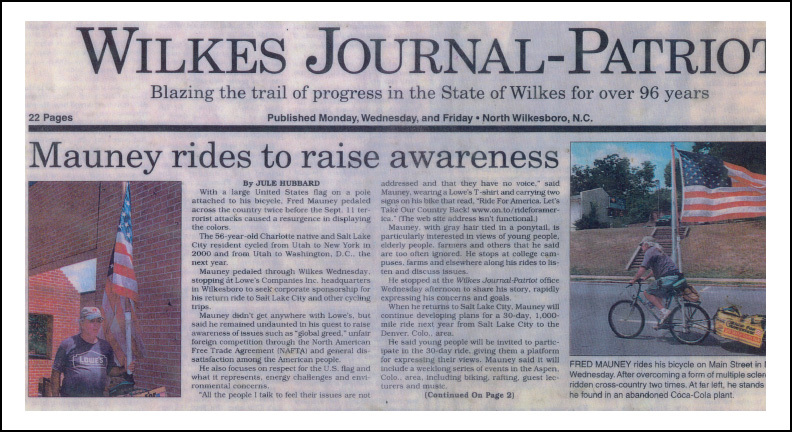 When Fred rode across the United States on his "Ride for America", He found that there were many citizens unaware of what their country's Flag actually stands for and represents. 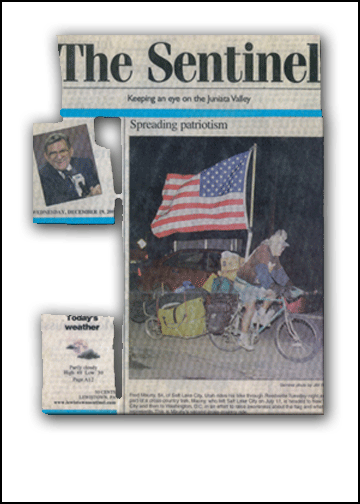 After riding across the country twice with the American flag, and talking directly with the citizens, and seeing the lies, fraud, and deceit from both political parties and the major media, He inverted the flag to signify the DIRE state of the nation. For three days, Fred rode around the White House and US Capitol with the American flag inverted to raise awareness of all of the transgressions being perpetuated against the American people. The "Pigs at the Trough" poster is symbolic of the arrogance and contempt of our elected officials and their impotence with dealing with our pressing national issues. Heading east from Vernal Utah to Dinosaur and Grand Junction Colorado, Alone, riding 10 to 14 hours a day, with temperatures exceeding 100 degrees, Fred carried the Water for America. Photo by Dean Humphrey of The Daily Sentinel, Grand Junction, Co.
Leaving College Park Pennsylvania (Penn State Univ.) that morning Fred rode over 10 hours and arrived late that evening in Reedsville, Pennsylvania. 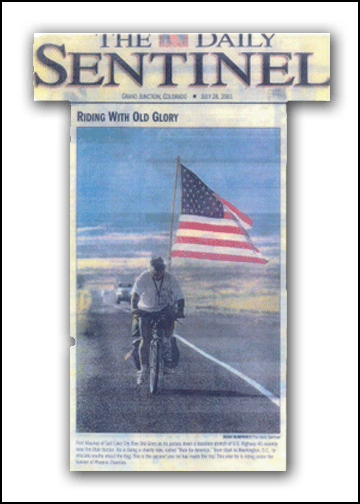 A Sentinel photographer set up lights to catch Fred in his patriotic journey. Where Fred's people come from, the mountains of North Carolina; "Home Boy Country", with Jerry Rushing of "Dukes of Hazard" fame, Actor Robert Mitchum's "Thunder Road", and the start of NASCAR. "We brew it and we grow it...what we get away with is ours... if we get caught we do a little time". Fred and Shenn, brothers in arms, here in the Sugarhouse area, a bed of activism in an ultra-conservative state. Shenn is one of the original supporters of Fred's many battles with the unjust and illegal establishment. Shenn is also the web/graphic designer for Fred and Phoenix Charities. Why the hell are our soldiers and citizens dying over in Iraq to create a Democracy, when We know as well as they know, there is alot to be desired with how our Democracy is run here. If our Democracy was run as it should be, and could be, 9-11 never would have happened.